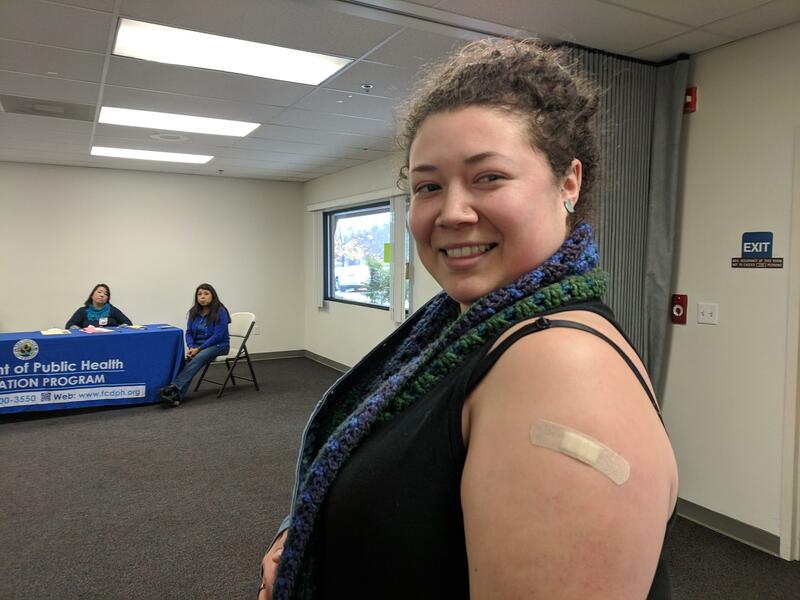 FM89 reporter Laura Tsutsui opted for what she believes is her second-ever flu shot after talking with a health educator with the Fresno County Department of Public Health. Wherever you live in the Valley, whether it’s Hanford or Tehachapi or Merced, we all have to contend with the flu season. It’s already claimed one life in Kern County. Last year, the CDC estimates the flu killed 80,000 Americans. That puts influenza among the top 10 deadliest conditions in the U.S, along with cancers, heart disease and diabetes. But although there’s an easy way to reduce the risk of flu—the flu shot—around 60 percent of Americans elect not to get it. Unfortunately, many do. In the last five years, the flu has killed 1,100 Californians. It’s sent another 2,600 to the intensive care unit. But a mistaken flu identity can’t be the only reason people avoid the flu shot. I set out to find a skeptic, and I didn’t have to go far: Monica Velez, a fellow reporter at FM89, says she can’t remember the last time she got a flu shot. “I wouldn’t say that I’m a denier or anything, I think I just really don't have enough information,” she said. It’s a similar story for Laura Tsutsui, another reporter in the FM89 newsroom, who will admit to being “flu shot ambivalent.” “It was easy when I was in college when they had all these [vaccination] drives, but now that I work, it's just not a part of my routine and it's never been a habit,” she said. 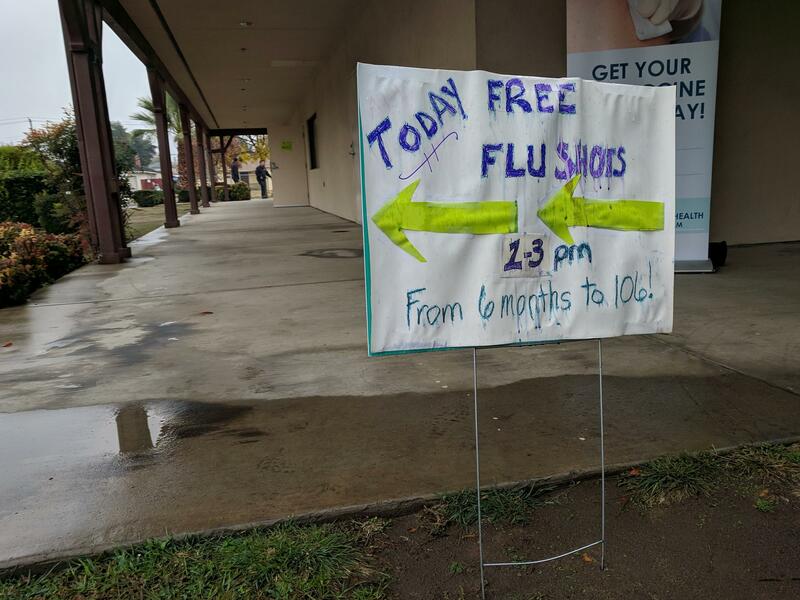 Like other county health services, the Fresno County Department of Public Health holds regular flu shot clinics free of charge. Flu shots are also available in most doctors' offices and in many pharmacies like CVS. But they were willing to consider it this year, so they agreed to come with me to a flu shot clinic in East Central Fresno. There, we met Leticia Berber, a friendly woman with a big, warm smile. 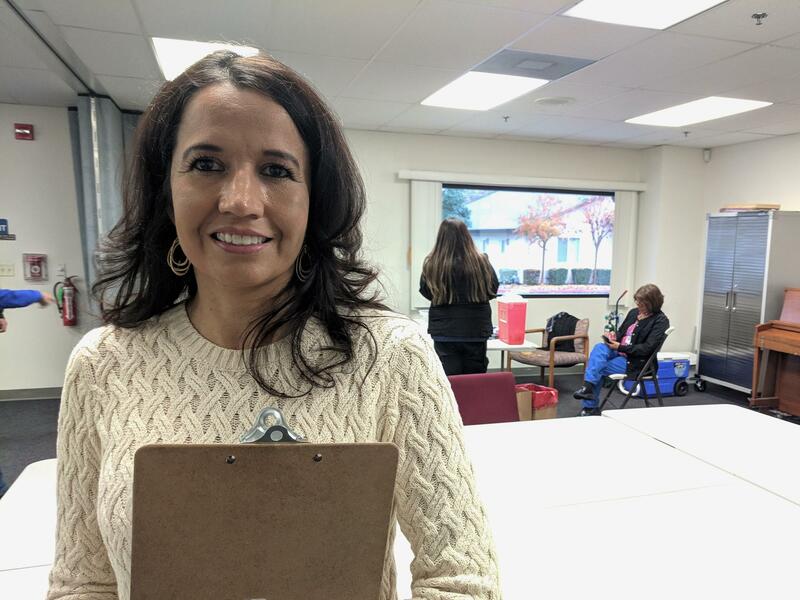 “I'm a health educator with the Fresno County Department of Public Health, and we are here giving out free flu vaccines,” she said. Laura and Monica came prepared with questions. Laura began, explaining that she and her siblings rarely fell ill as children, so she’s grown up believing her immune system is strong and healthy. “With that in mind, why should I still get the flu shot?” she asked Berber. Leticia Berber is a health educator with the Fresno County Department of Public Health. “Let's say you have your grandmother living with you, let's say you have a 5-month old nephew that cannot get vaccinated,” Berber said. By getting vaccinated, “you are protecting those individuals, not just yourself." Herd immunity: In which enough people are vaccinated against a disease to protect the rest of the population from it. Monica continued. “Has it been proven that this is the way to avoid getting hospitalized because you got the flu?” she asked. The answer: Yes. “The flu vaccine is the best method to protect yourself against the flu,” Berber said. Of course, the vaccine is nowhere near perfect. Its effectiveness varies each year, reducing the risk of flu by roughly 40 to 60 percent. That may not sound like a lot, but Berber says it’s enough to protect against some strains of the flu, and make the others less severe. Nurse Janie Rodriguez with the Fresno County Department of Public Health administers shots at a free vaccination clinic in Fresno. Monica addressed one reason she had stayed away from the flu shot for so many years: Hearing conflicting information, including rumors that health professionals would deliberately put harmful chemicals into vaccines. “Have you heard that at all?” she asked Berber. Then there’s the toxic metal mercury, an ingredient in a vaccine preservative known as thimerosal. Most vaccines have phased thimerosal out, but Berber said it’s still contained in some batches of the flu shot. Even then, the FDA says the amount in one dose is on par with the amount of mercury in a can of tuna (and it’s not the same form of mercury that can build up harmfully in the body). If you’re still concerned, Berber says you should be able to request a mercury-free flu shot. Health experts also argue there’s no evidence the flu vaccine suppresses natural immunity—another very common concern—though it is an active area of research. Either way, the virus mutates over time into different strains—so even if you overcome one flu strain, and build up immunity to it, the next year’s strain will be different and you could still fall ill from it. By this point, Laura and Monica felt good about what they heard—good enough to get their first flu shots in years. The process was smooth and easy. They began by filling out a form with some health screener questions, like whether they’re pregnant or allergic to eggs—questions that don’t determine whether or not to get the flu shot, but which form of vaccine to get, and whether medical observation is recommended after receiving it. Monica Velez, also an FM89 reporter, had passed up the flu shot for years because of competing information she had heard about the vaccine and its side effects. 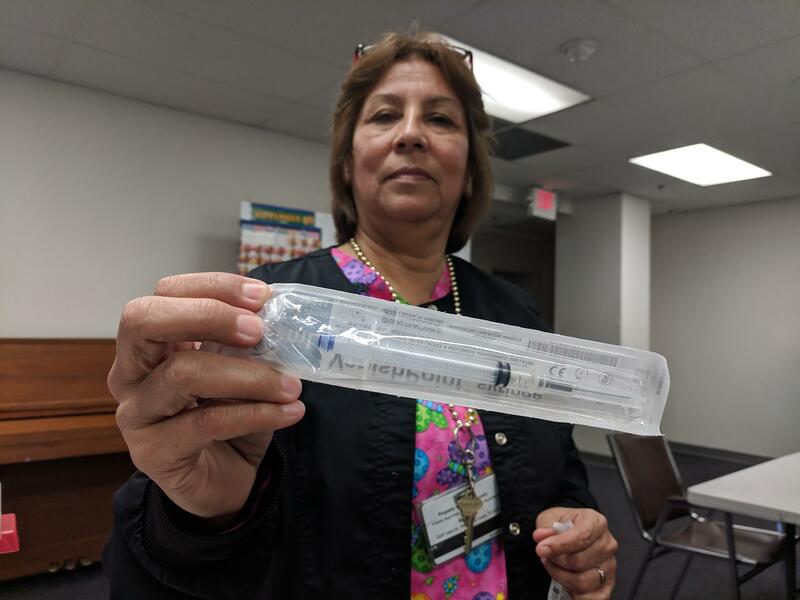 Then they were ushered to a nurses’ station, where a public health nurse named Janie Rodriguez pulled each syringe out of a cooler in a sterilized, single-use package. “I'm going to wipe your arm, and I'm going to pinch your arm a little bit,” she warned, cleaning Monica’s arm with an alcohol wipe. The process was over before Monica even realized it. “Is that it? Really?” she laughed. A small pinch to prevent a big problem. If you’re curious about the flu shot, you can ask your county’s public health department, or look it up with the Centers for Disease Control and Prevention. You can find the flu shot at doctor’s offices and pharmacies like CVS.